The band, the music & all related topics. So does anyone have any information on Re-Vox Turnball? As in, does anyone know why he left or does anyone even have a picture of him? And what was his real full name? Well... Re-Vox's real name is Barry Turnball and apparently he left Play Dead to become a health inspector. The information came from a guy named Sean who knew Re and Rob. Barry was already a health inspector. When things started happening for the band he had to make the choice band or job and mortguage. the rest is history and I not complaining. 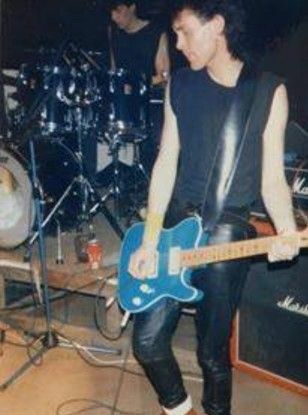 Actually, Re was in a band with me after PD - the less said about that the better. More amusingly, In his Environmental Health role he was known as 'The Hatchet' locally after closing down a popular restaurant in Bloxham. 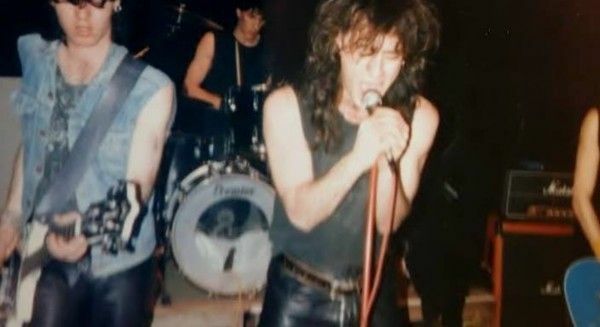 Later still he was in another thrash punk band (whose name escapes me), with a guy called Paul Adkins (Pob) on bass. Paul used to play bass in Rob Hickson's first band, The Exits... later known as the Squares - The band scene in Banbury was somewhat incestuous. I wouldn't swear to this, but I seem to recall Play Dead were originally called Desperate Dance when they first kicked off. The first time I remember the name Re-Vox being used was at Sweeny Todd's Pizza parlour in Oxford - they used to call your name out when your Pizza was ready. The 'Re' bit was from 'Barry' (a name he didn't like) and 'Vox' after the legendary VOX AC30 amp. His favourite guitarist was Daniel Ash from Bauhaus. Consequently, after learning how to play the guitar, he had to learn again because he wanted to hold the thing down by his knees..... like Daniel Ash. Talking of Pizzas, I remember Rob Hickson, Ali (The Caber) and me doing a runner from St. Michaels Pizza Parlour in Oxford after eating our fill. Unfortunately we were chased by a bunch of 'student type' vigilantes who rallied behind a chant of, "Get them... they haven't paid for their meal". Needless to say they didn't catch us as we were 'pumped up' on adrenaline and fleet of foot. We eventually made our getaway in Rob's silver Mk2 Cortina back to Banbury. On the way home, Ali was hanging out of the back door of the car (can't remember if he was being sick or not, but the car was travelling at considerable speed) and he lost his spectacles. Tinkle tinkle - gone...... unfortunate considering he was the photographer for the Banbury Guardian at the time. That wouldn't have been the Exits who released the Yodelling EP in 1978, would it? Or another Exits who did 'The Fashion Plague' for Lightning around the same time? If not, there were at least three punk bands called the Exits extant at the same time . . .
Time to drag this thread up from the vaults, as a few pics of Re Vox's post Play Dead band The Flower Walk have turned up online. No clues about the exact place or the date, but according to my memories it is probably around the late 1980s (1986-87?). 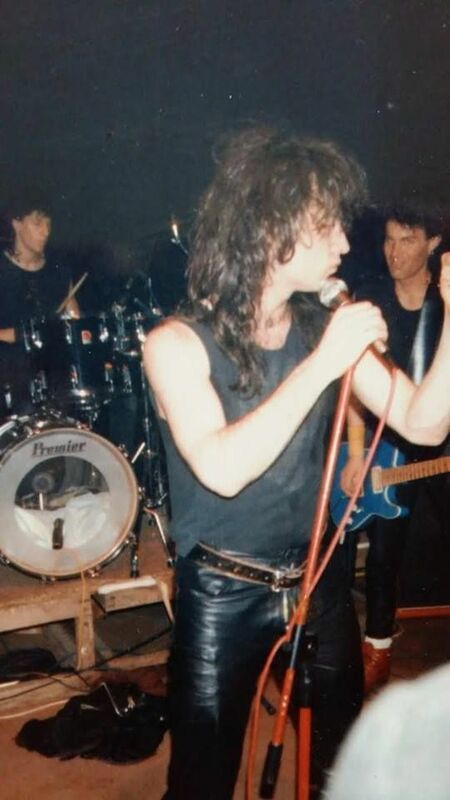 The vocalist is a chap called Max, a well known character around the Banbury/Oxford axis who was also the chap who supplied Play Dead with the lyrics for 'Propaganda'. Re Vox's birthday today. Happy Birthday to you etc. Interesting. I haven't been around in a bit. I enjoy reading the old stories on here. I'm curious, did Flower Walk ever record anything? Pale Fire wrote: did Flower Walk ever record anything? A demo tape exists. We are currently trying to track down a copy.